Severe storms that moved through North Texas left thousands without power Thursday and into Friday, causing several school districts to cancel classes. As of 9:30 p.m. Friday, Oncor reports more than 113,000 North Texas electricity customers remain without service. 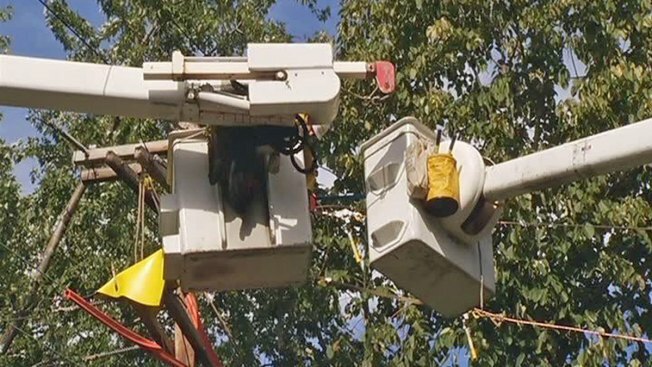 Crews from Oklahoma, Alabama, North Carolina, Kansas, New Mexico, San Antonio, Austin and Houston are assisting in repairs. Oncor estimates 95 percent of power will be restored by Sunday evening. The outages forced schools to close in several districts in both Dallas and Tarrant counties. NBC 5 Meteorologists warned of thunderstorms Thursday that brought hail, heavy rain, lightning and high wind. At the height of the storms, Oncor's storm center online showed more than 196,000 outages across North Texas, with Tarrant and Dallas counties reporting the most outages. Oncor told NBC 5 this was one of the largest storms in its history. Oncor asks anyone with a power outage to call 888-313-4747 or text "OUT" to 66267.